Professor Matteson brings to the Simon School over 25 years of experience in technology and manufacturing management and in strategy development in large corporations. 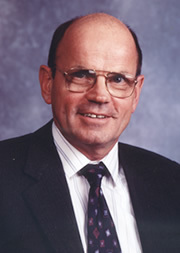 Matteson was previously senior vice president and manager of electronic imaging at Eastman Kodak Company, which he joined in 1965. He holds an MS degree in electrical engineering from Rensselaer Polytechnic Institute and received the Hugh H. Whitney Award for highest academic honors from the School's Executive MBA Program in 1979. He serves on several boards and is active as a management consultant. He teaches corporate strategy, economics of competitive strategy, marketing strategy and negotiation theory and practice in both the regular MBA and Executive MBA programs. Matteson was previously senior vice president and manager of electronic imaging at Eastman Kodak Company, which he joined in 1965. He holds an MS degree in electrical engineering from Rensselaer Polytechnic Institute and received the Hugh H. Whitney Award for highest academic honors from the School’s Executive MBA Program in 1979. He serves on several boards and is active as a management consultant.